Considering the need for more and more postgraduates especially in rural areas, the Government of India has been working out plans to increase the number of these PG seats. The Medical Council of India (MCI) is a statutory body responsible for maintaining highest standards of quality of medical education in India and recognition of various postgraduate and super-speciality courses in medical colleges in India. The National Medical Council Bill, 2017 which is set to replace the existing Medical Council Act,1956. With some evident history of failures of MCI, Government has recently appointed BoG committee to run this contentious MCI. Now, even few researchers are inclined to wonder about the enforcement of minimum standards in the Medical profession and the effective availability of specialised qualified conscientious doctors serving rural India. Growing criticism of unavailability of specialist doctors in the difficult areas across the country led to the urgent and much-required transformation in Medical Education. Since the Indian Health care crisis spur rapid growth in the number of Medical PG seats in the country and the powers of MCI have been vested in BoG, we are witnessing many Rules and Regulatory clauses being amended in short span. While Few landmark amendments in POST GRADUATE MEDICAL EDUCATION REGULATIONS,2000 benefited in-service doctors granting incentive marks on the basis of their service in rural, remote and difficult areas for the purpose of determining their merit at the NEET PG exam for admission into PG medical courses. This policy of incentive marks encouraged doctors to serve in those remote areas and has been most effective in bringing about improved medical workforce retention in many such remote tribal and Naxalite areas with a long-standing scarcity of doctors in the country. Currently, there are around 28500 (Total in clinical, paraclinical and preclinical) Postgraduate Medical degree (MD/MS) and Diploma seats in Government (15000)+Private (8500) and Central Institutes (5000) (AIIMS, PGI, JIPMER, NIMHANS) in India.This total no.is set to increase to 40000 PG seats as per Govt planning and budgeting. There are around 150000 medical graduates aspirants competing for PG admission every year. As we see, this year 2019 MCI created around 2500 additional PG degree seats with at weak, in so far as PG Teacher: Students Ratio or Bed strength norms are being changed and no major infrastructural developments or facility uogradation needed. This tactical evolution followed a scheme proposed by MCI scrapping all the PG diploma seats and enabling medical colleges to seek an equal number of PG (MD/MS) degree seats in the country. 1. They are deprived of the opportunity to continue their existing courses into MD/MS, ending up in a limited avenue of career progression life long. 2. Abolition of Diploma courses during their study period seriously damages brand equity of the course and demoralises the students. 3. Both students of degree and diploma are equal in terms of curriculum, training at same college and MCI requirements of infrastructure and clinical facilities, pay same fees; with the only difference lying in the duration of one additional year in MD/MS degree dedicated to THESIS. 4. Students if reappear NEET for PG degree will make them slog for 3 years whereas up-gradation of the existing diploma courses into degree course will make specialist available within 1 year. 5. Recently, MCI has also changed the qualification criteria (MCI amendment notification No. MCI-12(1)/2017-Med.Misc./115698 dated 05.06.2017) for different positions and promotions namely, faculty and senior resident, denying an important opportunity to the petitioners which has impaired their future prospects as qualified doctors. 6. The fact that the BOG feels conversion of diploma to MD/MS seats is a measure to reduce the paucity of medical specialists or teaching faculty itself exemplifies the fact that they recognize the diploma holders are unable to fulfil any such gap. And yet they have not provided any relief measure to candidates doing diploma courses who have put up a lot of hard work to come to such level by tough competition and qualifying NEET entrance exam. There are two types of medical students who join the PG diploma course— One set of them join the branch because they are madly in love with it and the other set join because the then scenario lured them with at par scope and same subject specific competencies of degree-diplomaa courses or students though meritorious were lured by the prospectus for the diploma courses and the opportunities offered by the Diploma. 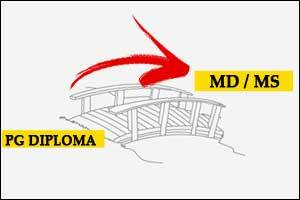 I deplore needless mention of just a few students joining diploma because they did not get a degree. Diploma courses which were erstwhile recognised by the MCI,have now been denitrified seriously impinging upon its brand equity.Perhaps,these PG diploma courses would suffer an existential crisis;thanks to regulatory agencies that haven’t really understood the pain of ongoing diploma students. The MCI seems to take forever to understand that bringing in uniformity in PG medical education is of crucial importance.Now,the logic and rationale behind not continuing diploma is well justified to raise standards by the enforcer MCI,the apex statutory body.But, the ultimate decision of surrendering seats rests with the particular Dean or Medical college or the state and few of them have already strayed from this route. This impugned MCI amendment notification No.MCI-18(1)/2018-Med./12294 dated 12.07.2018 continues disparities and severely affects the PG aspirants opting for diploma courses in upcoming PG admission counseling. With addition of around 2500 degrees eats MCI granted by this diploma conversion scheme in recent notification, initially de-notified all the diploma seats. But, it was tempted again to re-notify few 500+ diploma seats which couldn’t be allowed conversion because colleges lacking adequate resources to run degree or due to procedural inadequacy .The council would have operated much more effectively to take more pragmatic solution. There are only a few 500-1000 diploma seats remained as against 25000 degrees for PG admission this year.While, Diploma students are treated as secondary to the MD/MS Degree students wherein they are also made to serve in remote/difficult/rural areas in the country by way of a bond whereas theMD/MS Degree are only allowed entry in Medical colleges get perks of living in cities. The only current opportunity with limited resources for diploma holders is to pursue post-diploma DNB ,is like fighting a battle more than once to win it! He has to reappear the same entrance exam and even after managing to obtain a DNB degree, its the equivalence withMD/MS is already in doubt. So, it costs whole youth spending many years in medical studies and long era of full hours of residency with break periods for PG preparations and bond service. With such erratic behaviour of MCI,Why does MCI want these few students to suffer when no future prospects and career progression has been left for diploma?No with it upon this arbitrary scheme shows that MCI has threatened its autocratic power. Without confronting the reegulatory boards,I firmly believe that de-notifying al the diploma seats at once in al the medical colleges ,is the single most pragmatic approach to many problems. As an act of protest, I believe,many PG aspirant MBBS graduates & their parents can’t even think of opting for diploma;they would rather be preferring admission to degree at some alternative college! they would rather be asking MCI to abolish al the diploma seats! they would rather be agitating and demanding uniform PG medical education! they would rather be raise against inefficiencies ofMCI & deficiencies of medical colleges ,if any! My heart felt request to Government, as the time has come when it must redeem that promise of uniform higher education with minimum standards, which sustained hope for years. It is time to give voice to anger and frustration of those thousands of young doctors in the country who thirst for being aware with degrees. Can we rise together to ensure this happens sooner rather than later? Please Dr chaudhuri. Well done u tell UR lawyer to stress on huge faculty and specialist crisis will be meet very shortly if this is accepted by GOI . 2ndLY u r NEET qualified. 3rdly MCI is frequently changing their criteria of recognition of medical colleges. Nothing is fixed , every rule is changeable time to time , so why not UR demand will be accepted by BOG,MCI & GOI.